This product is ideal for greenhouse, home and office to monitor the room climate and to assist in providing the right comfort zones. 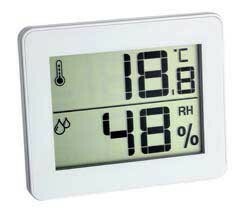 Display of room temperature and humidity. Fold out leg for free standing on table or shelf, or can be wall hung. Max min button on back to review humidity and temperature maximum and minimum. Battery included 1 x CR2025.